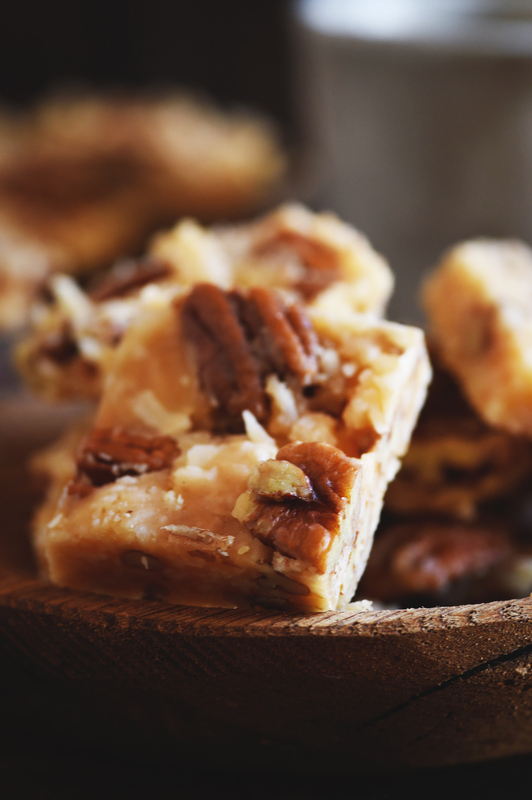 This Low-Carb Coconut Pecan Snack Bar Recipe delivers a delicious portable snack. 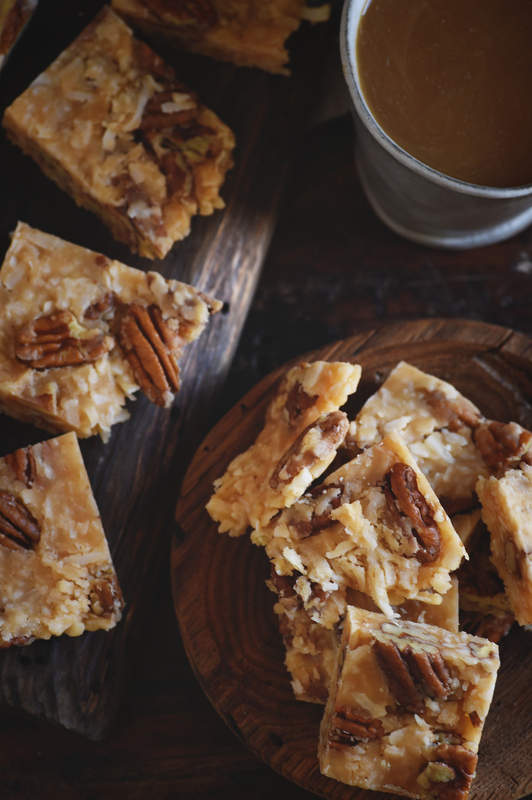 In this recipe, nuts and coconut are drenched in caramel to make a satisfying treat. These bars can be part of a low-carb, keto, diabetic, gluten-free, grain-free, or Banting diet. 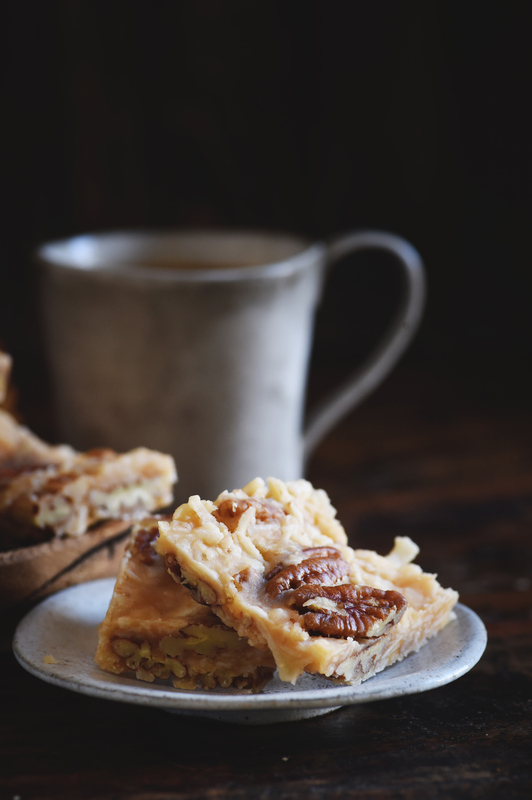 This Low-Carb Coconut Pecan Snack Bar Recipe is loaded with coconut and pecans bound together with caramel goodness. What a sweet, chewy, crunchy snack! This recipe is sweet enough to be used as a dessert and special enough to be wrapped up and given as a gift! This recipe was inspired by Kind bars. I used to eat these bars occasionally as a quick, transportable snack. I liked that they used whole ingredients and were gluten-free, but unfortunately, they are not low carb. Because of this, I haven”t had one in ages. I have seen a few low-carb and sugar free versions of Kind bars, but these all contain maltitol. Maltitol is a sugar alcohol that has some side effects that I would not wish upon any of you. You know what I’m talking about. It has a reputation for its laxative effect as well as its ability to produce flatulence. I learned my lesson about maltitol after I ingested an entire candy bar sweetened with the substance. No details are required here, but let’s just say that this is not something I want to do again! While some people can eat maltitol with no problems, most (but not all) can eat erythritol. Even though erythritol is a sugar alcohol as well, it has fewer side effects. Most people can eat this sweetener without any issues, which is why I use it in many of my recipes. In any case, since I can’t eat the maltitol sweetened commercially available bars, I decided to make my own. 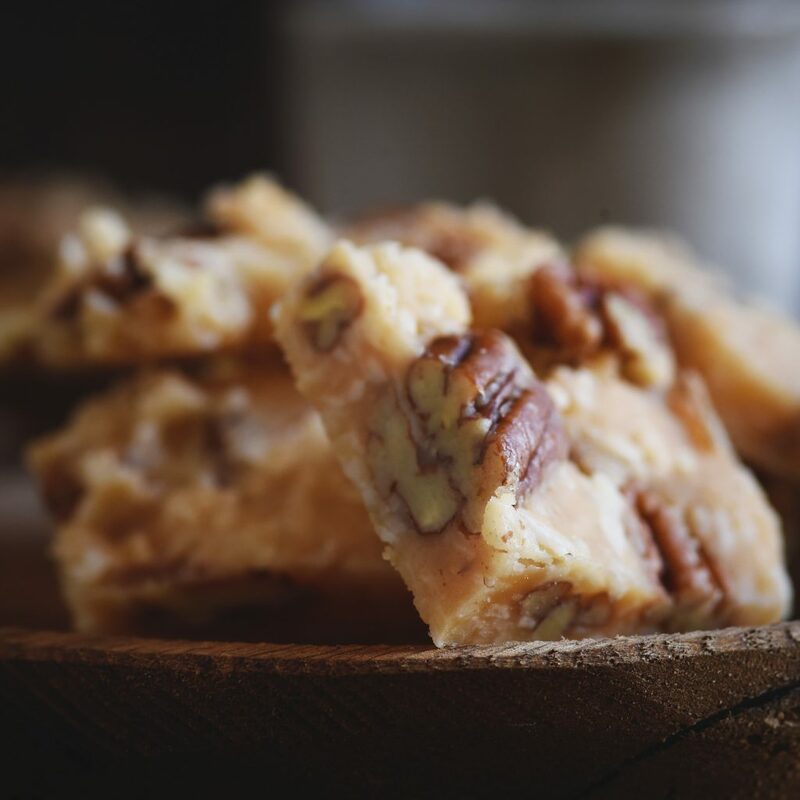 I began creating this recipe by altering recipes for low-carb nut brittle. The results tasted good, but had that “cooling effect” that erythritol can give. Instead of giving up my apron, I decided to alter my recipe for caramel sauce. The VitaFiber syrup decreased the cooling effect of the erythritol and the heavy cream added that rich caramel flavor. The results were exactly what I was looking for. This recipe is easy to make, but requires a bit of preciseness. I used a candy thermometer to help you follow the steps exactly as I did. Under or overcooking the caramel will change the consistency of the caramel. Be sure to have have your baking dish lined with parchment and all of your ingredients ready before you start. Being prepared will help you work quickly. These bars set up quickly! You can cut these bars into squares, bar-shapes, or break them apart, depending on how you would like to serve them. I hope you love them as much as I do! Enjoy! Line an 8" X 8" baking dish with parchment paper. Have a candy thermometer available. Place butter in a 1 1/2 to 2 quart saucepan. Melt butter over low heat. Stir in VitaFiber syrup and granulated sweetener. Bring to a simmer, stirring constantly. Simmer mixture over low heat, stirring constantly, until mixture reaches 250º Fahrenheit. Stir in heavy whipping cream. Mixture will foam up. Continue heating mixture, stirring constantly until mixture reaches 268º Fahrenheit. Remove mixture from heat. Working quickly, stir in the vanilla extract and salt. When mixture is smooth, stir in the coconut and pecans. Transfer mixture to prepared pan and spread evenly using the back of a buttered spoon. Refrigerate until cool. Cut into 12 even bars using a serrated knife. Store in the refrigerator in an airtight container. Serving size: 1/12th of the recipe. Is there a substitute for Vitafiber IMO Syrup? I haven’t tried it, but perhaps a low-carb maple syrup would work. these are amazing. do you know how long they will last in the fridge? I’ve kept them for 3-4 days without any problems. I haven’t tried the VitaFiber IMO syrup before. Is this something you can get at a chain grocery store? It looks good. Perfect for an after-Thanksgiving treat. I don’t think many chain grocery stores cary this. I usually get mine from Amazon. I’ve never used Vitafiber IMO syrup before. I will have to pick some up so I can try this recipe. Oh God, what a tasty looking this Low-Carb Coconut Pecan Snack Bar is! I am in love with the colors and how simple and short the ingredient list is. Yum! I’m a fan of fudge but not all the loaded in sugar. I’ll have to check out these sweeteners. Does it make 12 or 16 servings? You say to cut it into 16 pieces…but under ‘recipe notes’/macros, you say 1/12th of the recipe. I’m making these right after I make the Snickers Bars! THANKS for the great recipes. You’re welcome! I just double checked the nutritional information and it is divided into 12 servings. Thanks for catching the discrepancy.